Updating the great productions from the golden age of American musicals (late 1940's to early 1960's) is a tricky business. 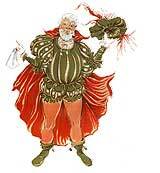 Many of them are rife with cultural prejudices, both spoken and unspoken, that are offensive to today's audiences. Even in the case of Rogers and Hammerstein, whose works broke ground in many ways, there are some obstacles. 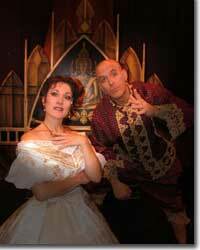 All this makes Boulder's Dinner Theatre's production of The King and I an impressive achievement in creativity and artistry. Opening with a report of drums and a splash of deftly flourished silk banners that set the tone for what directing producer Michael J. Duran calls "a play with music," we are transported back to the Kingdom of Siam as it first appeared to Western eyes. Despite the exotic tropical trappings, however, circumstances are difficult for Anna Leonowens, who has come from England to teach the king's children about the vast world outside their borders. Shelly Cox-Robie hits all the right notes as the widowed schoolmarm, inspiring devout loyalty in her students and the scorn and then admiration of the sovereign. Her bright, warm soprano, shaded with an impeccable British dialect, is stirring as she takes us on a lovely ride through "Whistle a Happy Tune," "Hello, Young Lovers," "Getting to Know You," and "Shall We Dance?" Wayne Kennedy mixes imperiousness and impishness to bring us a King worthy of fear and endearment, and gives us a clear taste of what it is like to have one's wish everyone's command. He makes the most of "A Puzzlement," displaying the King's multifaceted and contradictory personality, while inviting us to share his difficulties in bringing a society from the feudal to the industrial age. Amy Grass is a thoughtful Tuptim, revealing the heartbreak and fear of a slave in "My Lord and Master," and the hopes of young love that she shares with the stoic Brian Jackson, as Lun Tha, in "I Have Dreamed." We get a taste of the respect and fondness afforded rulers in "Something Wonderful," sung by Jade Tiller's Lady Thiang, and in A.K. Klimpke's formidable Kralahome. And lest we forget that we are guests of a foreign sovereign, the music, colors, and dances that accompany each scene change bring us back to the simple joys of a long-ago magical kingdom. 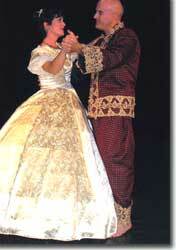 The King and I, Boulder's Dinner Theatre's 100th production, runs through March 26, 2006. 303-449-6000.